SOAK ORANGE PEELS IN VINEGAR FOR TWO WEEKS IN A SEALED MASON - ProudMummy.com the Web's Community for Mums. 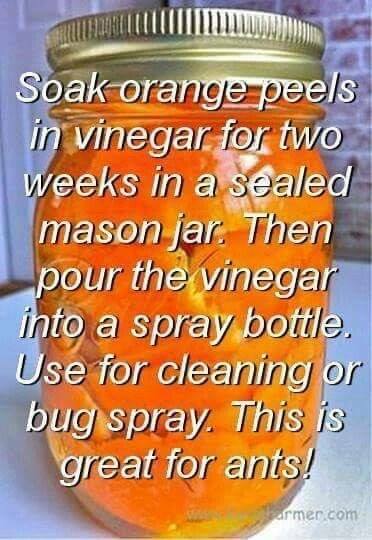 SOAK ORANGE PEELS IN VINEGAR FOR TWO WEEKS IN A SEALED MASON JAR. THEN POUR THE VINEGAR INTO A SPRAY BOTTLE. USE FOR CLEANING OR BUG SPRAY. THIS IS GREAT FOR ANTS.